One of my favorite lessons regarding decomposing shapes is when teaching students (5th grade and up) how to measure surface area. 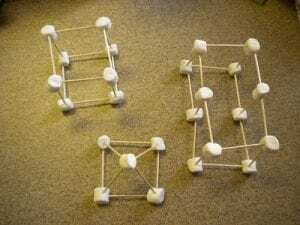 Click HERE for the free pdf guide for creating the rectangular prisms shown below. It includes a blank grid so you can create your own (all courtesy of http:illuminations.nctm.org using their “dynamic paper” lesson). 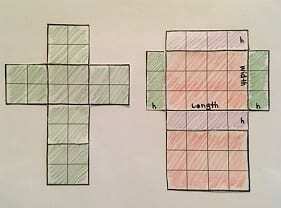 Create different nets of rectangular prisms (including cubes) on one inch graph paper. 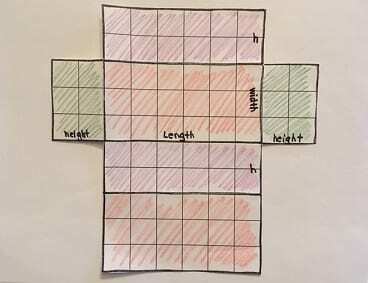 Students find the rectangles with the same dimensions and color them the same color. This means there will be three sets of equal-size rectangles (or six equal-size rectangles when dealing with a cube). Cut out around the outside of this net. 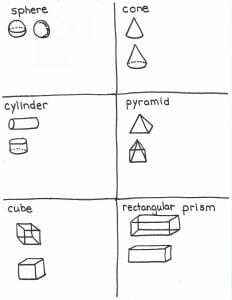 Fold up to see where the equal size rectangles are in relation to each other (on opposite sides of the prism). Repeat with different size nets. 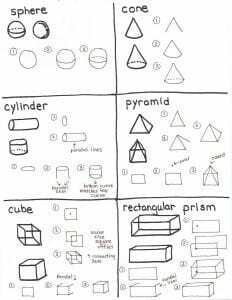 Guide students to develop a formula or rule to determine the surface area of pictorial rectangular prisms. area of the side (x2). This is because they are able to physically see the front and back are the same area, the top and bottom are the same area, and the two sides are the same area. Yes, the typical surface area formula is 2lh + 2lw + 2wh, but I have found that students often have difficulty determining which numbers on a pictorial model represent the length, width, and height, or get confused with which dimensions they have calculated and which they haven’t. Go to illuminations.nctm.org activity called “Cubes”. It is an interactive lesson in which you can change rectangular prism nets to your specs and see how surface area and volume are determined. There are lots of cool activities at this site (nctm = National Council for Teachers of Mathematics). Enjoy!! Next time I will focus on another aspect of geometry — angles and lines.